Hah hah! She says. Eureka! I know what to do with the breakfast tray. Can you say, "tole," people? There's really only one itty bitty problem. I don't know how to tole paint. I did have a book at one time that supposedly taught you everything you needed to know in three easy lessons. Or something like that. But last year during the nesting phase I looked at it, looked at my burgeoning middle and said, "I'm never going to have time to learn how to do this!" and out it went. Well, I am sure I can figure it out. And with all this inspiration, I should be good to go, yes? 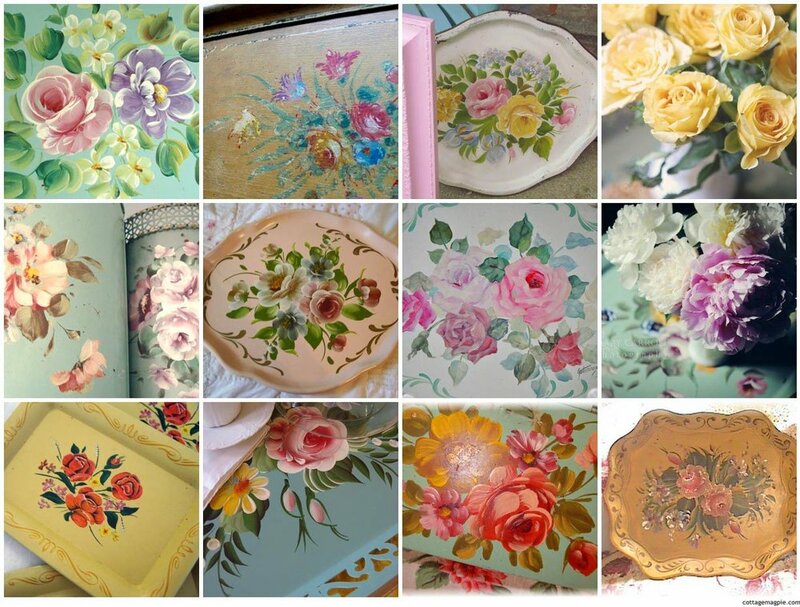 I know I want an antique-y creamy background and a delicate touch with the flowers. Beyond that I'm totally making it up. But hey, they wouldn't call it "DIY" if we had any lack of sense... i mean, courage. Right? What about you? Do you tole?